The best backpacking rice costs and weighs almost nothing, cooks fast, and fills your belly, right? That makes instant white rice the winner in most backpacking menus. You don't want to overlook taste, satiety, and good nutrition, do you? 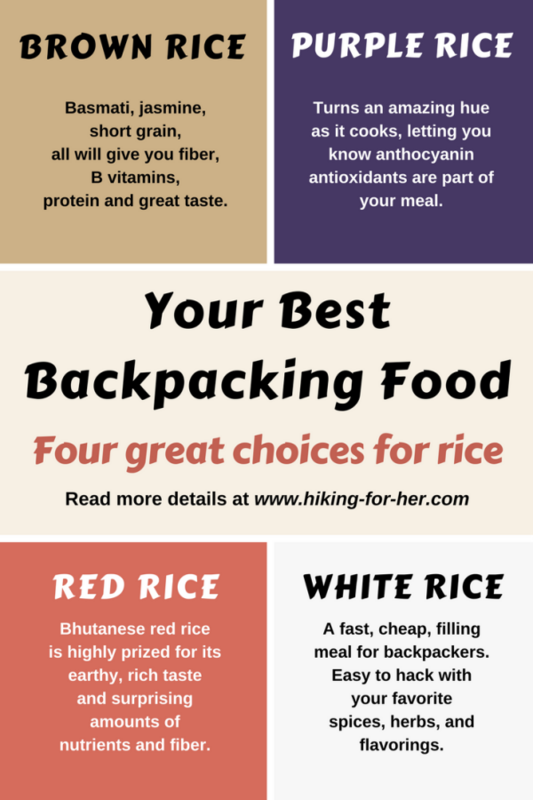 That's why I created these tips on picking the very best hiking rice for your backpacking menus, based on your individual needs. Because every delicious backpacking meal deserves a few tweaks before you head out onto the trail. Regardless of the color of the rice, you'll be getting about 200 calories from it as you digest and relax after your meal. Cooking times are left out of this discussion, but be aware that high altitude and cold temperatures will increase the amount of stove fuel and time you need to cook your rice. So when choosing the best backpacking rice, pay attention to the lingo so you'll get the results you expect. If you crave the complexity and carbs of creamy risotto (arborio rice) on your trip, let Good To-Go do the hard work for you. First, let's look at the good news about a common candidate for one of the best backpacking rices: instant white rice. The first thing to note is that this rice has been stripped of its outer hull, where the bran & germ are located (fiber, nutrients and oils). This gives you advantages and catapults it to the top of the best backpacking rice list for many backpackers. It is your best choice if you're going for cheap, fast and filling backpacking food at the end of the day. Short grain white rice has the highest starch (sugars, as in carbohydrates, as in energy for your body) content. Also the shortest cooking time. Another benefit of white rice sold in the United States: although its outer hull and associated nutrients have been stripped away, by law it must be enriched with B vitamins (folate, niacin, thiamin) and iron. Read about the importance of folate for young women here. That makes it an excellent source of blood building nutrition, which any female in her reproductive (menstruating & childbearing) years will appreciate. Males don't need external sources of iron, so it's not beneficial in that regard. 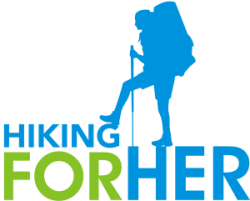 The B vitamins are the main story for male hikers. White rice doesn't have as much potential to become rancid, because its natural oils have been stripped away. This translates into a longer shelf life when you return from a backpacking trip with uncooked white rice. Give it the sniff test to detect unpleasant odors before you decide to use it on a subsequent trip. Bring along some vegetable, chicken or beef bouillon to add to the cooking water, for a more robust flavor and to boost white rice higher in the best backpacking rice category. Be sure to guard the bouillon (and other cooking seasoning) from moisture, using a small container like this one. You can cook any of the other rices this way as well, with more water and a longer cooking time. Adjust the amount of bouillon accordingly. White rice isn't a good choice if you're looking for fiber, nutrients such as B vitamins in their natural form, or generous amounts of trace minerals like manganese, selenium, or copper. Why the heck would you want these? If you're pregnant, menopausal, or simply want to support your nervous and digestive systems on your backpacking trip. If you're interested (and you should be) in proper enzyme function for high performing body systems. If regulating your blood sugar within normal limits (diabetic or pre-diabetic) is a problem for you, avoid the fast release of carbohydrates from white rice by using the other, low glycemic rices in your backpacking recipes. Brown rice can take 40 or more minutes to cook at sea level, and for a backpacker, that translates into a lot of fuel for the stove. And lots of hunger pangs as you wait. There is such a thing as "instant" brown rice, meaning it has been parboiled to reduce the cooking time you face when you use it. Its nutritional value will be lessened, but you save time and fuel. Don't expect miracles: still around 10 minutes give or take according to conditions. So parboiled brown rice could be ranked at near the top of the best backpacking rice choices for you. Brown rice begs for a long(ish) simmer time, a bit of salt, and up to 2 1/2 cups of water. Which means it's an investment meal, not something to hurry through to quickly fill up your stomach. Undercooked brown rice (crunchy, not soft) is going to set you up for digestive upset, so make sure you've got enough time, fuel and water before you begin cooking it. Jasmine brown rice cooks up soft and aromatic, meaning lots of bulk in your stomach and a wonderful aroma that doesn't need to be masked or enhanced with a lot of spices in order to make it palatable. Thanks, 2-acetyl 1-pyrroline, for the lovely aroma! Basmati brown rice has a light texture and a subtle flavor, so you can play around with spices and additions and not harm its contribution to the meal. Short grain brown rice is a workhorse, delivering lots of carbohydrates and nutrients in a small package. It's cheap, plentiful and tasty in its own right, which makes it one of the best backpacking rice choices all around. Always cook rice with the lid on the pot, and avoid the temptation to take off the lid to stir the rice. Timing is important to keep track of with any rice, but more so when it's a slow simmer type of meal. Let's sum up before we look at other best backpacking rice options. easily digested backpacking food without allergens. and a modest amount of protein, which can give you an edge in terms of endurance on a long backpacking trek. If you allow your cooked rice to cool in your cooking pot while you prepare other parts of your meal, or reheat it the next day, it will form a type of fiber called resistant starch. This fiber is part of good gut health, and most of us backpackers agree that digestive upsets are no fun on the trail. A steady diet of rice allowed to cool before ingesting it will help you avoid the dreaded "stomach" upsets. Purple rice looks black when dehydrated, turning a dark purple hue as you simmer it in your camp pot. Called Forbidden Rice (because allegedly only the Chinese emperor was allowed to eat it in antiquity), this rice delivers an amazing flavor some people describe as sweet, others call nutty. Let's just call it delicious! Its sticky texture creates chewiness, meaning your meal will last longer and allow your brain to signal fullness (satiety) without you having to gulp down a lot of fluids. Its deep dark color is due to an antioxidant called anthocyanin, also present in blueberries. Antioxidants are a great idea on a backpacking menu, and purple rice is the best backpacking rice if you're looking for those additional health benefits. And beyond that, bite for bite, purple rice delivers more fiber and protein compared with white or brown rice. If that isn't a vote for "best backpacking rice", what is? Purple/black/Forbidden Rice costs more than other rice, at least in the United States. Look for bulk bin stores and ask when (if) this particular rice variety goes on sale. Store your bounty in the refrigerator to protect it from rancidity until you can use it. This rice takes a long time to cook (20 minutes or more), and takes a lot of water (at least 2 cups, more for softer texture) to reach its correct texture. So if time and water availability are limiting factors for you, skip this rice. Makes a great entrée when weight and time aren't an issue: car camping or base camping, for example. The flavor and texture will make other rices look kind of bland and visually dull. Use well cooked, cooled black rice as a satisfying dessert, with a bit of fat and dried berries mixed in, and chew it slowly. You'd be surprised how wonderful it is at the end of a meal! The slow chewing releases the most starches for your taste buds to detect, so don't rush through it. Now here's something different to jazz up your backpacking menu! 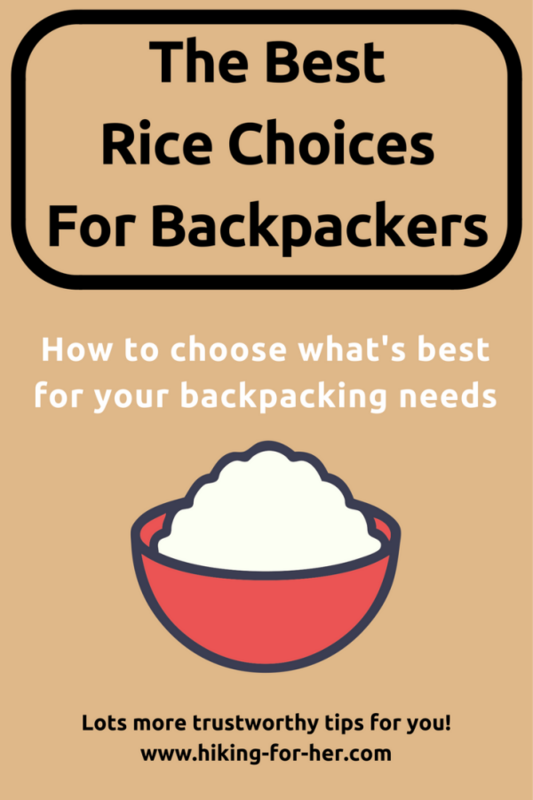 In fact, many backpackers don't know to include it on the list of best backpacking rice choices. This red rice from the Himalayas has a distinct taste, best described as earthy or nutty. A little goes a long way if your palate is not expecting this rice. Its color and size are distinctive as well, when compared to the other rices mentioned here: reddish brown and smaller grains. Its drawbacks are similar to black rice, in terms of cost and preparation. Slow chewing and thoughtful preparation time, as with black rice, is required to wring the goodness out of every mouthful. After a few evenings of standard backpacking fare, surprise your brain and taste buds with this unique and tasty rice. There are lots of boxed and bagged, as in pre-packaged, rice options on the market, making it easy & inexpensive to grab and go. Some of the tastiest pre-packaged rice dishes include garlicky vegetable rice mix and seasoned rice medley. Love heat in your food? Try this spicy Korean mixed rice dish! If you need to avoid excessive amounts of sodium in your diet, be aware that many of these pre-packaged rice entrées and snacks can be high in salt. Most hikers need extra salt after sweating all day on the trail, however. Plain rice is boring after a long day of hiking. A few flavor ideas for spicing up your pot of rice will get you thinking about creative ways to get your carbs after a long day on the trail. ...foil pouches of chicken, tuna or salmon. Dump these protein sources (including any juices or oil) over your hot white rice, making an excellent fast meal that will fill you up. Or try these ideas for the best protein sources for backpackers. If you've simmered your rice in flavorful veggie or chicken or beef bouillon, just add some chopped nuts and golden raisins for crunch and sweetness, and call it good. But why not begin to think of white rice as a blank canvas, and herbs and spices as your paintbox? Dried mushrooms weigh nothing but can punch up the flavor, add nutrients, and provide a sense of meatiness to your rice without fighting other flavors. If you're tired and just want to roll into your sleeping bag for sweet dreams, eat some of the rice plain (fast, filling, easy digestion) and save the rest as breakfast rice. Or add a bit of cheese (long lasting calories and a more assertive flavor) if you're not into morning sweetness. Brown rice has a lot of personality all on its own, and you don't want to have a clash of flavors in your cook pot, right? You can also make the breakfast recipe mentioned above, yielding a sweeter, more substantial meal. Or go for rice pudding as a dessert, using a bit of sweetener and dried fruit. Ever try seaweed as a backpacking source of nutrients? Read this, and then sprinkle some nori on your brown rice for additional texture and saltiness (and a big dose of nutrients that are super easy to pack and deploy). To fuel your day long exertions, and to be able to do it again the next day and the day after that, you need your hiking food to contain sugars called carbohydrates. Besides delivering lots of carbohydrates, rice in your evening cook pot provides a bit of protein and the ability to blend well with whatever else you throw into the pot. It's also easy to dehydrate (i.e. pull all of the water molecules out of it), so expect it as the foundation of many freeze dried backpacking meals. In addition, this ancient grain is gluten free and not a source of other dietary allergens, making it a good choice for nearly everyone on the trail. over 40,000 varieties of rice? Good thing we stuck to the basic 4 types here. But the good news is that you'll never run out of backpacking rice options! Sorry, it's not a rice, although it looks like long grain rice. Botanically, it's the seed of a wild grass. Which means it's laborious to harvest, and therefore more expensive than some of the rices. Humans mix it with long grain brown rice when they want its nutty chewiness. Backpackers can use it that way too, if the budget allows. But consider it an add on, not a stand alone menu choice. You might agree with the answer "it depends" after reading this page. It depends on who you are, the type of backpacking you are doing, and how much time, money, fuel, water and energy you have for your backpacking menu. Match your rice to your hiking itinerary. On days when you'll be pulling into your camp site early and have abundant water, go with long simmer brown, black or red rice entrées. On long days, or when the weather turns unpredictable and the temperature or altitude is a factor, go with fast cooking, easy to rehydrate white rice so you can get into your tent faster. Near the end of your trip, when water soluble vitamins and trace minerals and other nutrients have been depleted, use whole grain rice options. Don't blend the 4 types of rice together on any one day, because your cooking time will be screwed up and some grains of rice will be crunchy while others fall apart. You want your gut to do a thorough job of extracting nutrients from every grain of rice. Choose a backpacking stove that can cook your rice the way you want it, either via boiling water or a nice slow simmer. Now you have all the facts to dial in the right rice as an important part of your hiking menu. Need more ideas on how to feel full on a backpacking trip? Some of the links on this website are affiliate links, taking you to products and recommendations that have stood the test of trail time. You pay nothing extra if you make a purchase via these links, and Hiking For Her receives a tiny commission.